Tiger Fish is a mix developed by Tommy Pickering, it is a blend of Tiger Nuts, pellets and fishmeals crushed into a groundbait for carp. It’s a sweet-smelling mix that came about after various discussions and observations from specimen carp fishermen, who were all convinced about Tiger Nuts and their effectiveness. 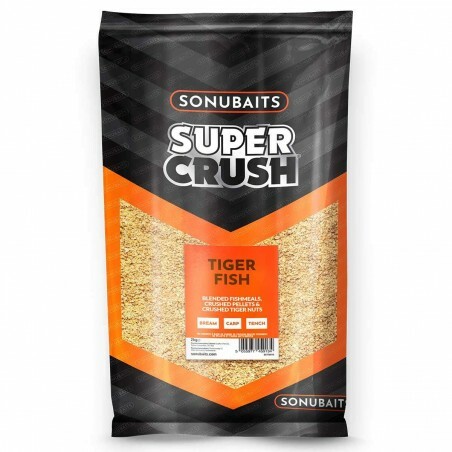 As the Tiger Nuts are crushed it releases the natural sugars and oils which help the mix go sticky when mixed with water, Tiger Fish is best mixed over damp for Method feeder work, but works just as well mixed normally for general feeder and pole work. It is easily mixed on the bank, and does not need to be riddled. The Tiger Fish combination has been phenomenal during testing and won various matches around the UK. It’s great for carp, bream and even F1s.